Blake Brown is a Pinot Noir enthusiast with an excellent palate and an eye for aged Pinot Noir. Recently, a friend of his had a number of well-aged Pinot Noirs to open, and along with his winemaker partner, hosted an evening in their home for this special happening. Fourteen attendees enjoyed food catered from the local Hitching Post Restaurant by Frank Ostini, who also participated in the tasting. Burt Williams attended along with six other prominent winemakers from the Santa Barbara County area. The dinner featured 12 Williams Selyem Pinot Noirs from 1987-1997, and 9 Pinot Noirs from 1954-1973 by Inglenook, BV, Charles Krug, Hanzell and Martini. The tasting notes to follow are by Blake Brown who kindly agreed to share his experience. 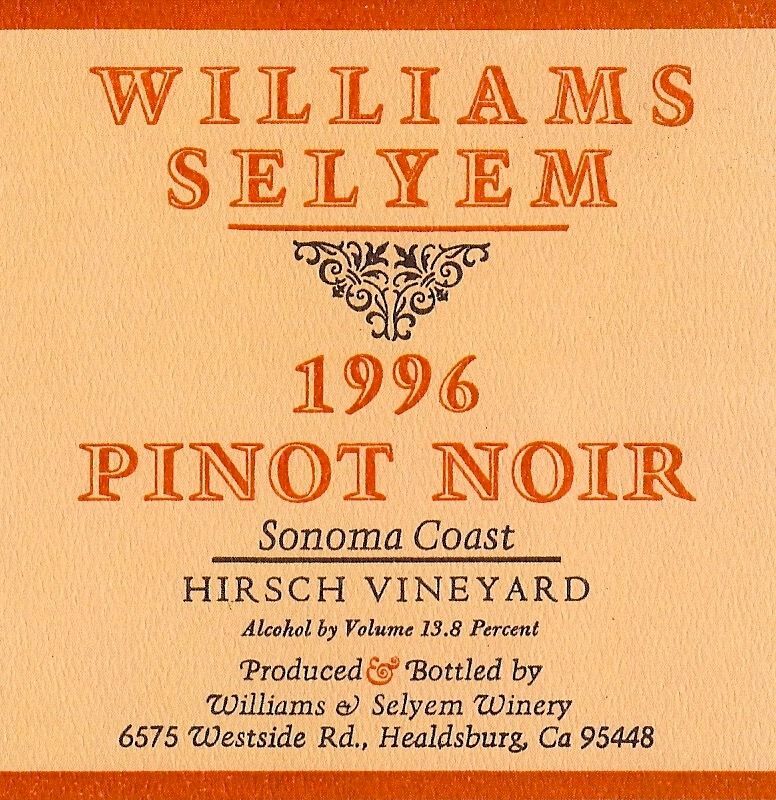 1990 Williams Selyem Rochioli Vineyard Russian River Valley Pinot Noir “Burt mentioned that this was a strange vintage that followed a few seasons of drought even though there had been some rain in late 1989. He felt this wine did not have has much going for it in comparison to all of the consistently great Pinot Noirs from this vineyard first planted in 1969. Burt commented that this was his best vineyard. This was a very good wine showing little signs of aging in the color or taste. It gave up wonderful clove-enriched cranberry and cherry fruit that was a bit briery. This bottle also got better with time, and raspberry and red cherry came in late to embellish the experience. This wine was light and easy, silky smooth, and preferred by some attendees as wine of the night. 1969 Louis M. Martini Special Selection California Mountain Pinot Noir “A better offering than the previously tasted 1966 vintage. More expansive with an immense amount of aromatics and taste. Decent tertiary plum, black cherry and blackberry fruit stood out. Blake’s final comments. “There were at least 6 of the 12 bottles of Williams Selyem Pinot Noir that shined ever so brightly and 3 more that on their own would have stood up and been counted in any setting. To have Burt at the table was an added treat and for some of us, it provided a invaluable dialogue for education and edification.